Wow! That looks like a proper adventure Jimo. Puts my pissy hour out and about to shame. Spent the majority of the day polishing bits and pieces for the new build whilst sitting in front of the TV watching Paris Roubaix. Best race of the year and my favourite won so well worth it. Though I then only had enough time for a short ride out on the Jack Taylor up to Dunnet Head and back. Much better than what I did today. Started off with good intentions, build up a bike for Clubby's gravelly ride. The bits I needed were at the back of the shed. Jamie knows what that means. Ended up with an all day job re-organising the shed. 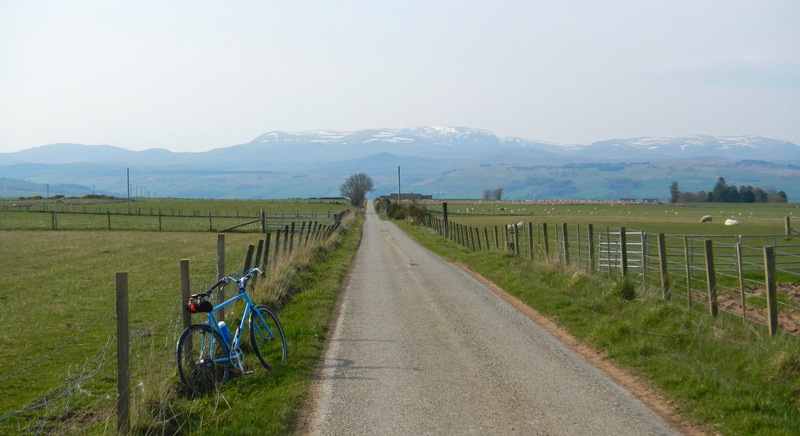 It's the first day in ages where I could just leave stuff outside for a few hours while I re-arranged the shed, so instead of building a bike and going for a ride as intended, I wasted my time. I did get other things done around the place like mowing the lawn etc but as it was Paris Roubaix day, the best race day of the year, I had planned to have it on the box from early morning and check on it now and again but for the afternoon I would get Caleb and I lunch and the sit and watch the action build whilst getting some stuff together for the King of Mercia tourer I am semi thinking of putting back on the road. I have a wanted ad up for some Mafac cantis and while there may be a set of long arms coming I have nothing as yet. 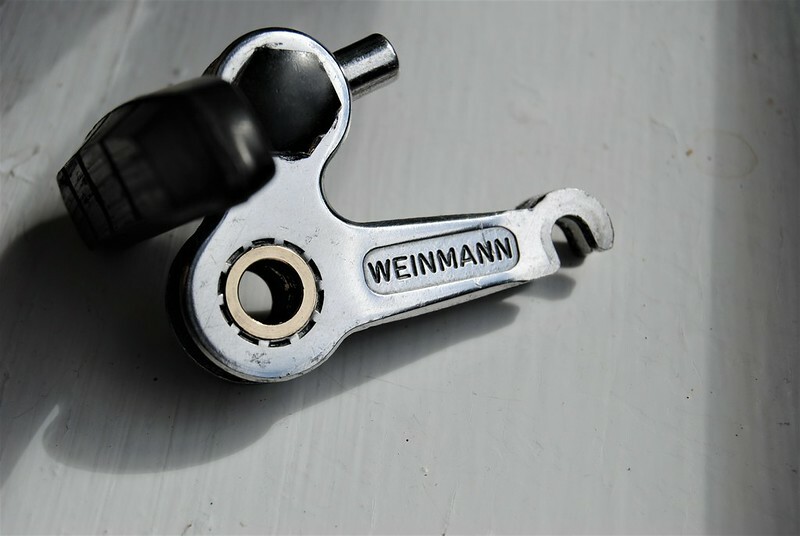 So I dug out the Weinmanns and they needed a bit of love so after a clean yesterday on petrol to get the worst off I then dismantled them properly and gave a polish this afternoon while in front of the TV. 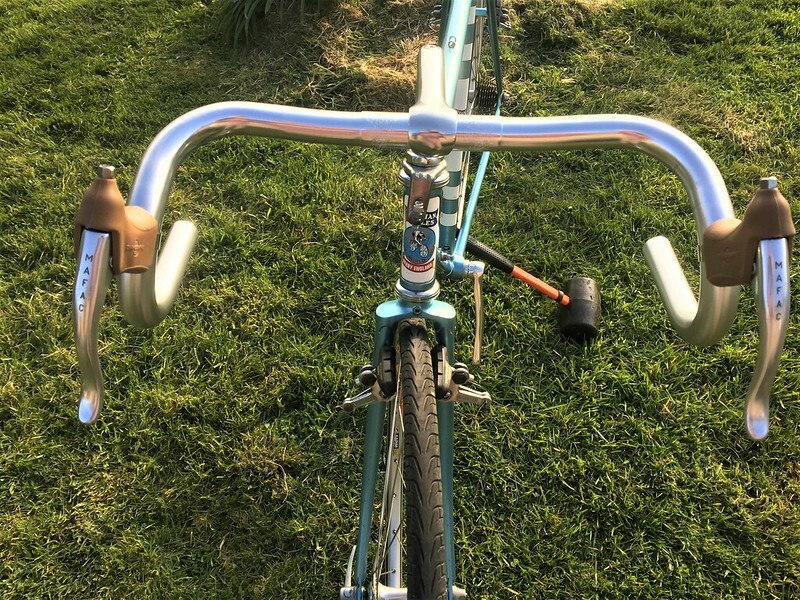 Then put the levers that should be for the Jack Taylor onto a new pair of Nitto B136 bars along with a new 90mm Nitto stem. Just for seeing how it would go together and also look. I also put on the Stronglight triple chainset that is earmarked for the green KOM. The Brakes came up a treat with just a minimal hand polish with some autosol, well pleased. All this while watching my favourite rider, Philippe Gilbert move to the front and win the race. Great stuff! 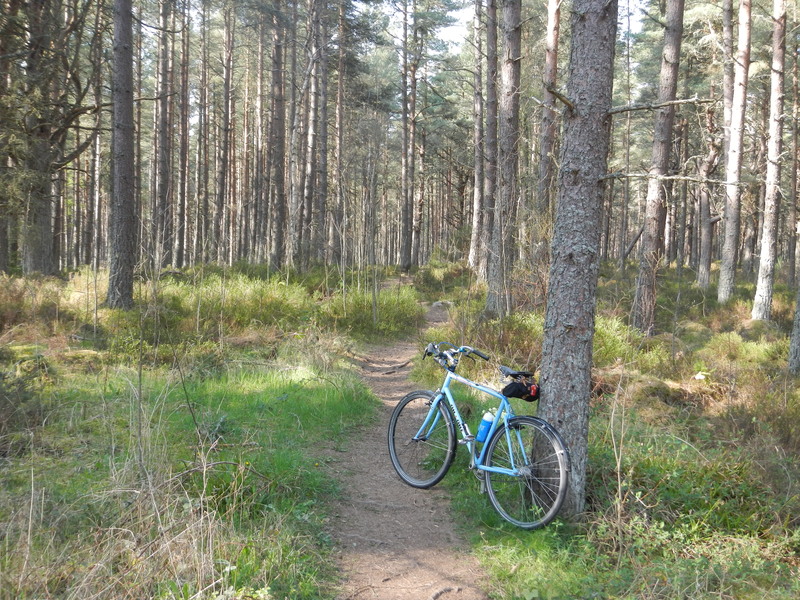 Then when Heather got home I still managed to finish the day off with a short ride on the Jack Taylor. Hope everyone else had a nice day as well. Should have taken before pictures as the difference is surprising to say the least. 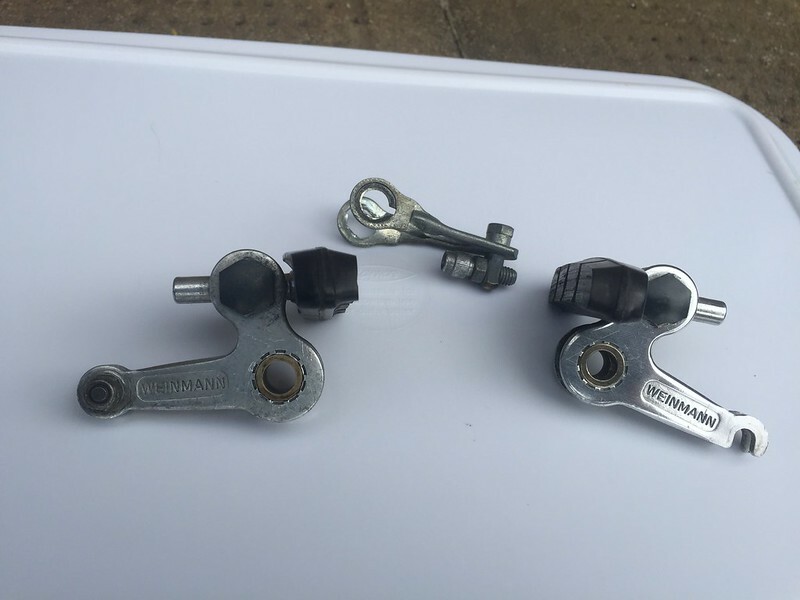 Loves those Mafac levers Jamie, will they end up on the JT? Peachy, they may well do but they will have Mafac hoods on them if they do, these have some NOS Dia Comp ones fitted. The levers are nice and not scrapped up or polished even. Just been sitting in the box for a while. 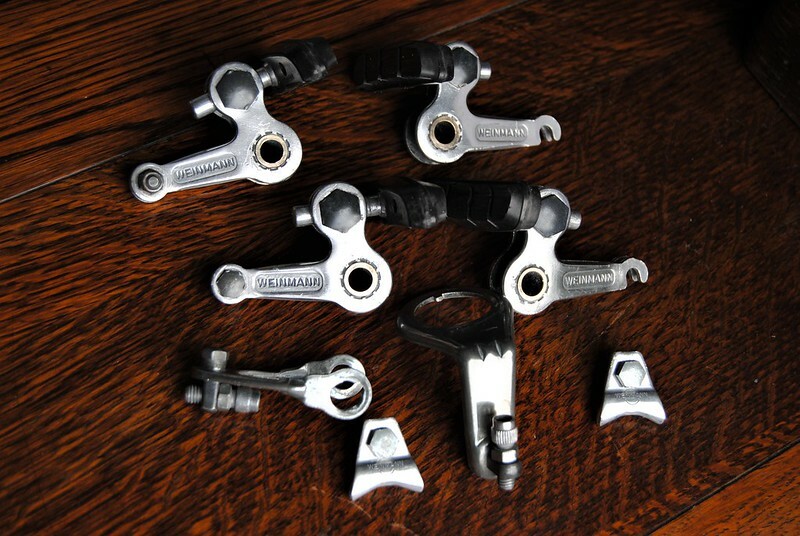 I am looking for another set but may go for the earlier drilled version and use those on the Mercian. These ones are from the JT box of bits. I had a lot of important stuff to get done today. 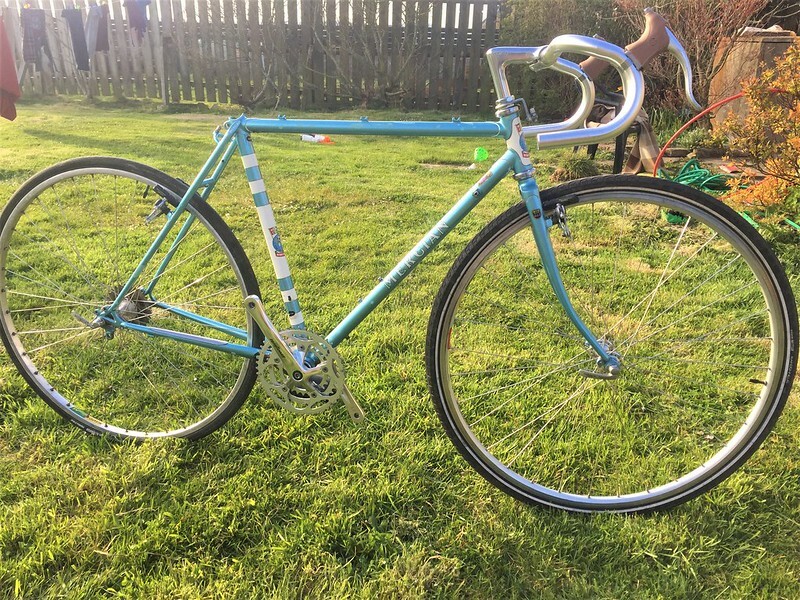 So instead i grabbed the nearest bike out of the shed and went looking for a suitable road ride for Jamie's new pride and joy, his Flying Scot. 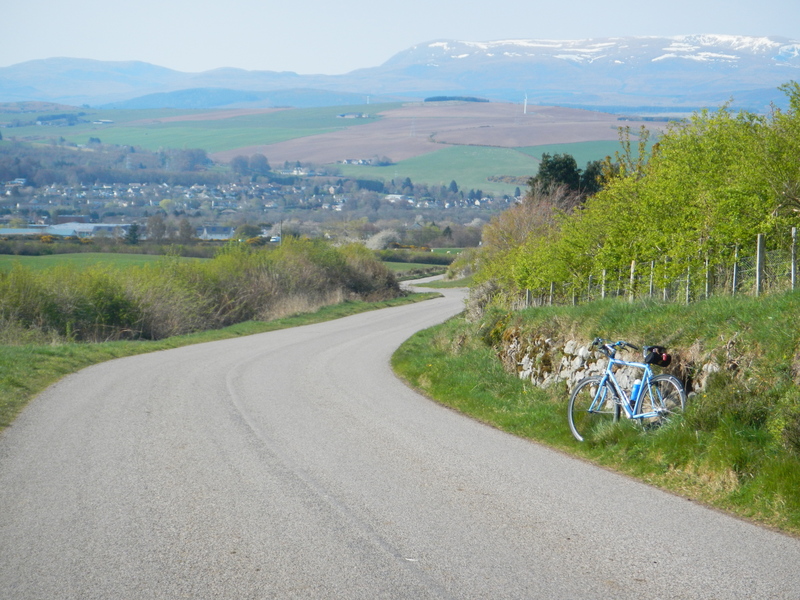 He'll like this climb, and it's a nice smooth virtually traffic free road. But what's this off to the side? 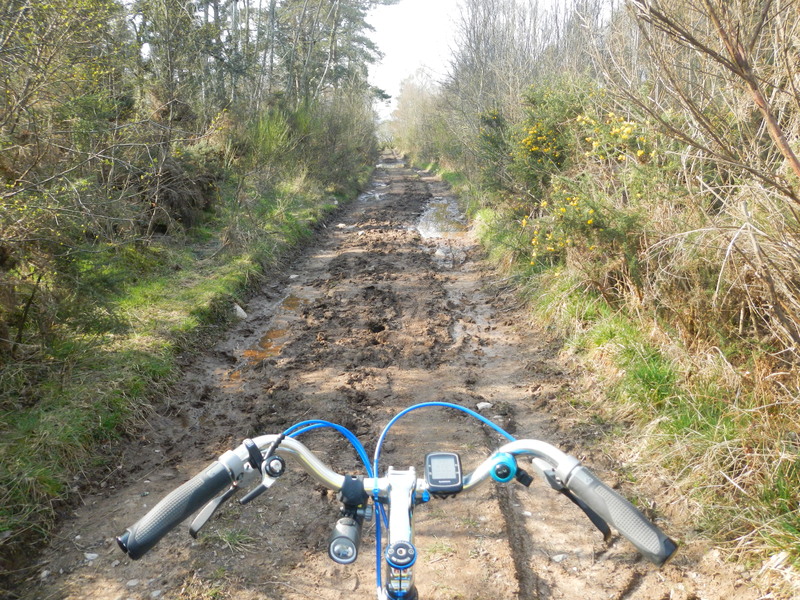 Why, it's a nice bit of narrow unsurfaced road, surely it's worth poking along this a bit? Even better, it opens out into a fine dual lane bike track. 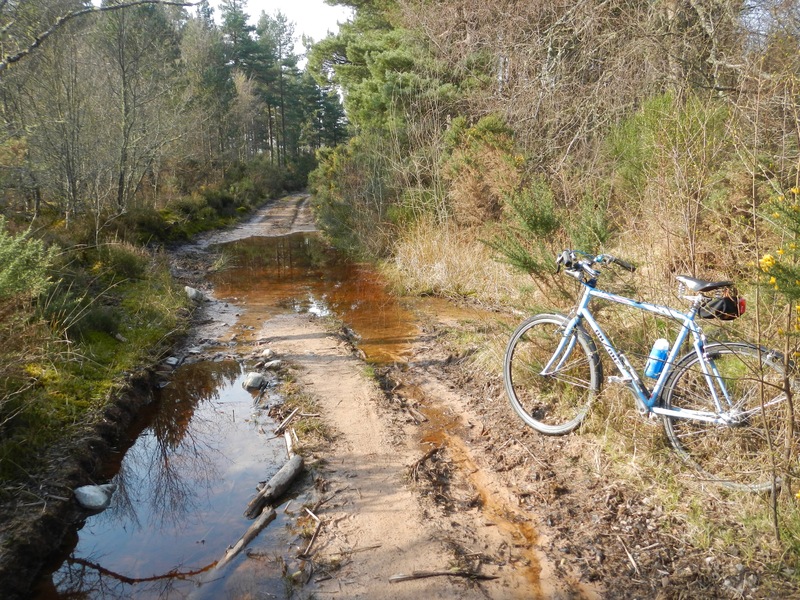 With natural cooling ponds for the over-heated cyclist. A tidy little ride all up. Maybe the stuff I had to do was not that important after all. 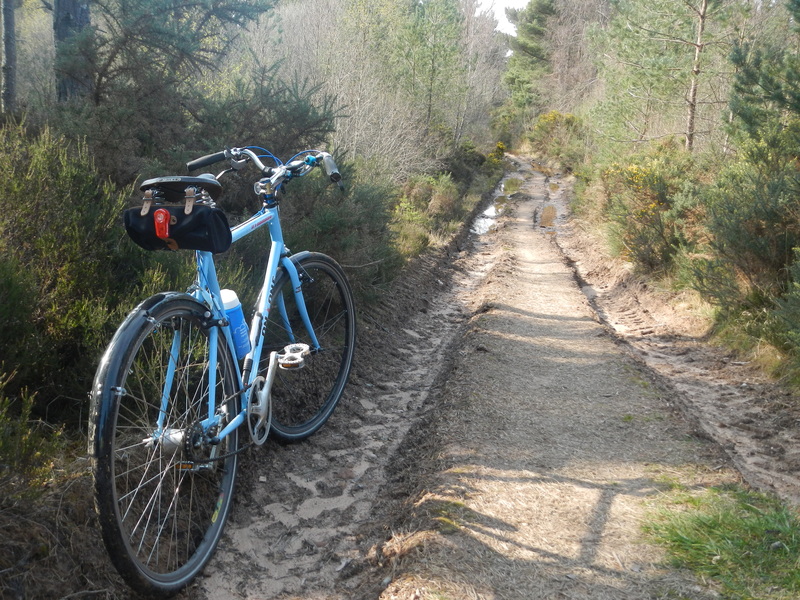 Been diverted from the Great Cull of 2019 by the prospect of Clubby's retro gravel ride. Started work on this Dawes Windrush. 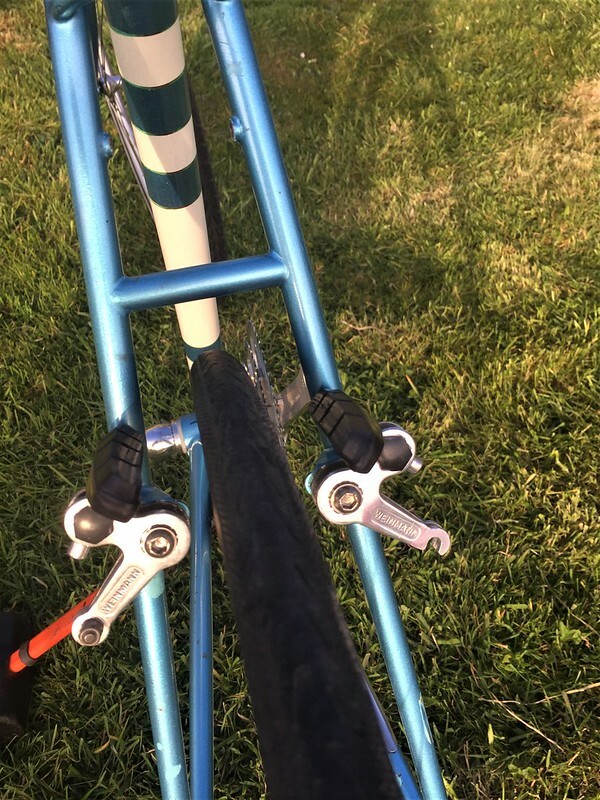 Got so far, but stymied by the seatpost. The clamp has been spread to get a 27.2mm post in, but not very far in. I'm pretty sure it should be 26.8mm or 27.0mm, so there's no point doing more work on it until I know for sure. One advantage of the GCo2019 is I have lots of goodies lying around or been rediscovered. So from a selection of frames and assorted carbon goodies from the "pile" I've cobbled this together. The frame was my old singlespeed race bike which I stripped back to the frame over 12 years ago when I moved on to 29ers, and it hasn't been ridden since. 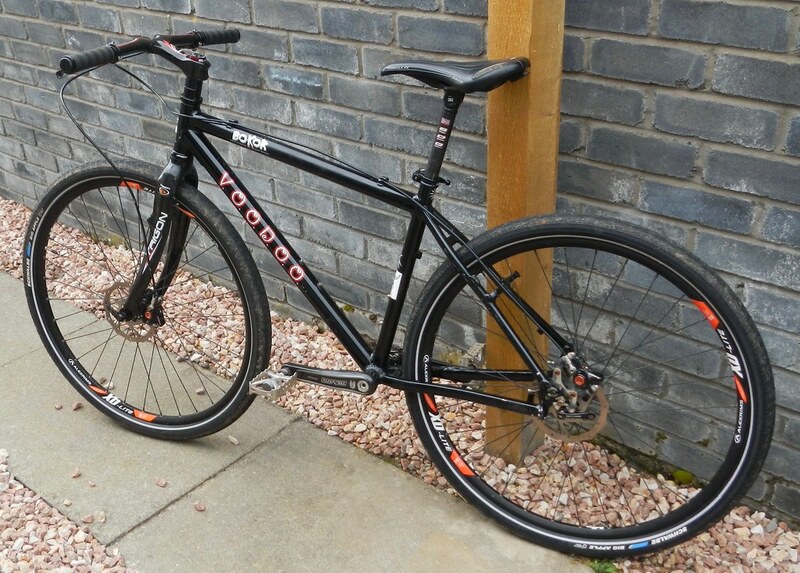 Surprisingly it can take a 29er wheel with a 2" tyre (but not much chain adjustment left). 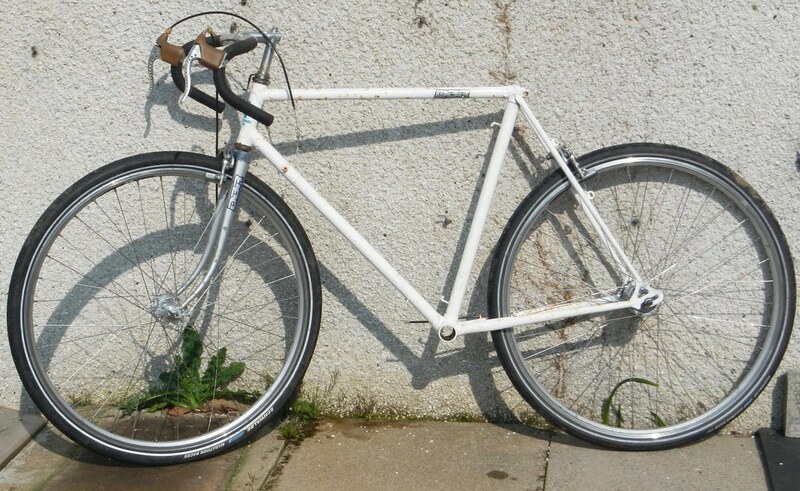 Seeing as it was rather nice I figured give it a go as a gravel bike, so this may be coming south with me. Currently stopped work while I try to find a combination of cranks, BBs, and chainrings that will give a decent chainline, but I could be riding this by tomorrow depending on what I can unearth. If all else fails, I'll take the Ti Pompino. 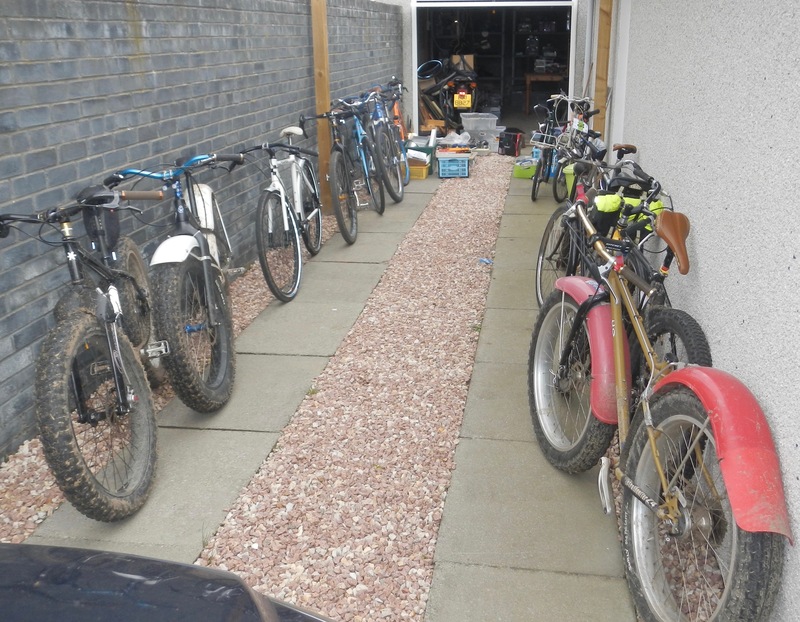 I do like the great cull of 2019 in theory, but do tell how many bikes have been culled as opposed to how many have been built?